Abuja — President Muhammadu Buhari has declared that the war against terrorism is "a must win," and has ordered the military to eliminate Boko Haram threat. 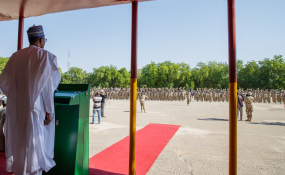 According to a State House press statement signed by the Senior Special Assistant to the president on Media and Publicity, Mr. Garba Shehu, President Buhari, who gave the order in Maiduguri, Borno State capital Wednesday, also commended the efforts of the military. He however tasked them to totally eradicate the terrorist group. "It is a must win war. I want to encourage our troops not to be distracted by speculations but remain focused and committed to the task of eliminating Boko Haram from the surface of the earth," the President said while declaring open the 2018 Chief of Army Staff Annual Conference. "I want to reassure you that as your Commander-In-Chief, I will do everything within my power to continue empowering you by providing all the necessary equipment, force multipliers and enablers required for you to prevail on the field. "I also want you to be aware that I am currently looking into measures to improve your entitlements and welfare generally," he added. According to him, "the officers and men who are fighting against the curse of terrorism in the North East deserve all the attention our country's leadership can give them. "As President of the country, I am determined to ensure that every citizen feels safe and secure in all parts of the country. To achieve this, the security agencies must rise to the challenge and curb threats to security in our country." President Buhari called on the armed forces to embrace "the wind of change that is blowing across the country," urging more cooperation at inter-service and inter-agency levels. "To this end, the Chief of Defence Staff and Service Chiefs must work closely together as well as with other security agencies to improve on strategies that will defeat terrorism, militancy and other forms of criminal activities in our country," he said. "I have come to pay homage to the gallant soldiers lost by the nation and to console the injured ones in recent terrorist attacks. I urge you to remain focused and win the war," the President said. President Buhari also commended Nigerian Army's commitment to upholding democracy and urged them to remain committed to their profession. "As we approach the 2019 General Elections, I want to urge all members of the Armed Forces to live up to their responsibilities and remain non-partisan. In addition, you must all remain vigilant throughout the electioneering period and alongside other security agencies, prevent every form of violence that could disrupt the process in line with your Rules of Engagement," he said.